His Royal Highness Prime Minister Prince Khalifa bin Salman Al Khalifa has stressed the importance of shared action by the international community to mature a wide-ranging vision to address security, political and economic challenges, and to take more effective measures to ensure peace and stability world-wide. 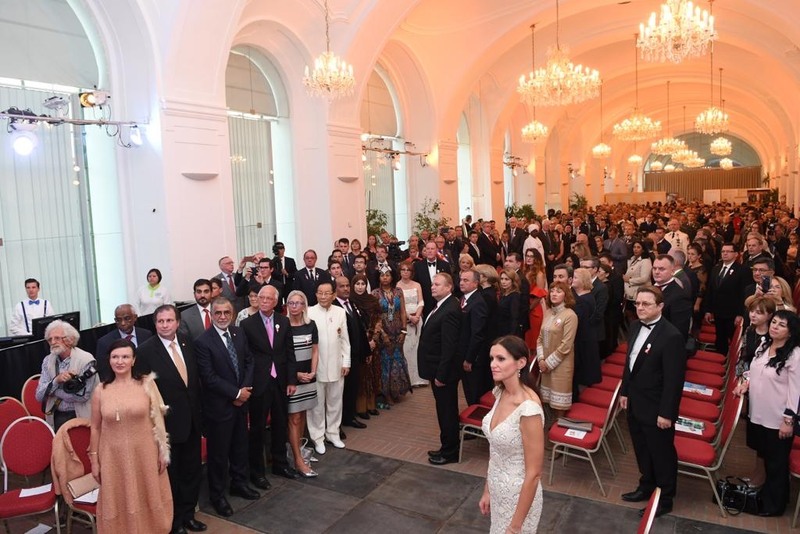 HRH the Premier made the statement while addressing the annual reception of the Flame of Peace 2018, by the Association of Peace Furtherance at the historic Schönbrunn Palace in Vienna, Austria. 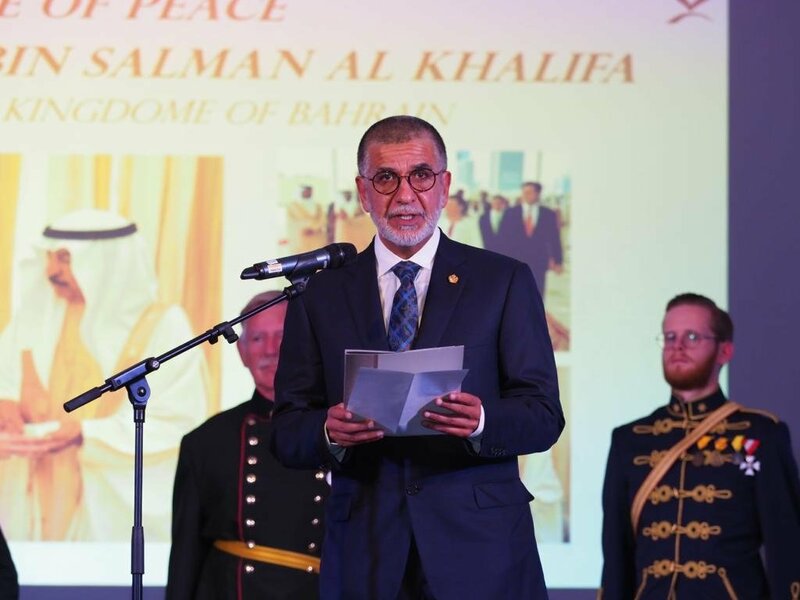 “The Kingdom of Bahrain believes that peace is capable of opening boundless horizons for cooperation among nations and peoples, and we are now more determined to continue our efforts aimed to mobilise international support for peace in the world,” he said. “As an international community, we need to join hands to strengthen the world’s peace environment, advance our responsibility towards our most in need communities, support their development efforts and establish sustainable peace for all the peoples of the world,” he added. The speech was delivered on behalf of HRH the Premier by H.E Shaikh Hussam bin Essa Al Khalifa, the Chairman of the Committee on His Royal Highness Prince Khalifa Bin Salman Al Khalifa Award for Sustainable Development. The annual celebrations of the Flame of Peace are important events to promote the spirit of cooperation among people and work together to spread a culture of peace, HRH the Prime Minister said, praising the noble message of the Association for the Furtherance of Peace to remind the international community of its responsibilities towards a world that is still troubled by unrest and armed conflict and terrorism. He reiterated the Kingdom’s keenness on the participation of the international community in all its efforts to promote and establish peace. The Premier stressed that the Kingdom of Bahrain pays particular attention to the issues of peace, security and sustainable development, as well as cultural diversity and openness. 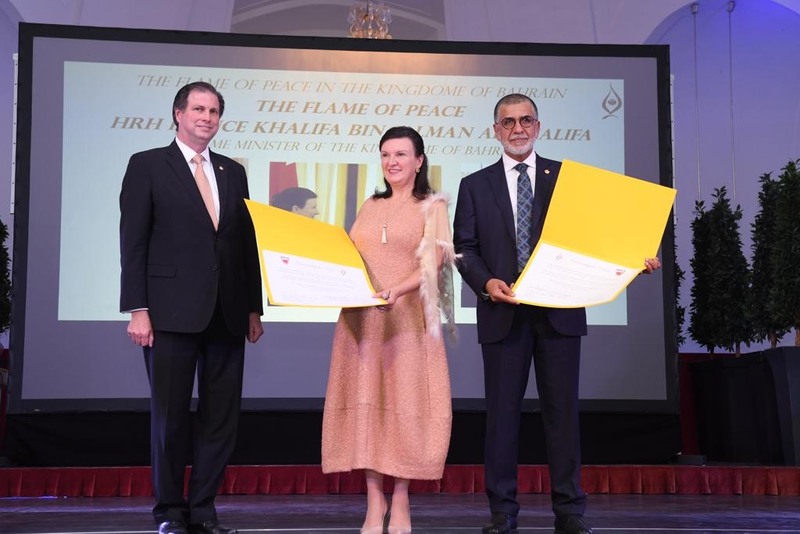 Her Imperial Highness Herta Margret von Habsburg, Archduke of Tuscany- Austria, President of the Association for the Furtherance of Peace, stressed that the Flame of Peace of 2018 highlights the efforts of His Royal Highness Prince Khalifa bin Salman Al Khalifa in the field of peace in recognition of his role and initiatives in serving international efforts to establish peace and stability. She expressed her appreciation for the attention he pays to the issues of peace and development in the world, stressing that the world looks with great admiration and respect to the high figures such as His Royal Highness Prince Khalifa bin Salman Al Khalifa, who contribute to the foundations of progress in the Kingdom of Bahrain. During the ceremony, an agreement of cooperation was signed between the Committee on His Royal Highness Prince Khalifa Bin Salman Al Khalifa Award for Sustainable Development and the Association for the Furtherance of Peace. It was signed by H.E Shaikh Hussam bin Essa Al Khalifa, the Chairman of the Khalifa Bin Salman Sustainable Development Award Committee, and Her Imperial Highness Hertha Margaret von Hapsberg, Archduke Tuscany – Austria. His Excellency affirmed that the agreement comes within the framework of His Royal Highness the Prime Minister’s interest in serving issues of peace and achieving sustainable development goals based on his belief in the importance of cooperation and partnership among all parties concerned to promote stability and peace for the future of humankind. A documentary shedding light on HRH Prince Khalifa bin Salman Al Khalifa’s high profile in fostering development and peace was screened.